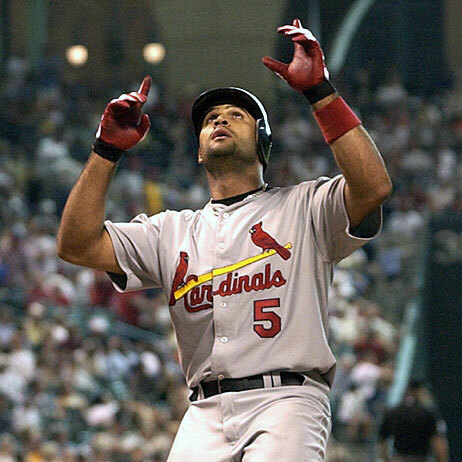 It was reported the Mark McGwire sold PED’s to Cardinals slugger Albert Pujols today. McGwire’s admission over the offseason was only a front, so he could openly sell them to players. About three weeks ago, I broke down the AL Cy Young race. I’m not so sure about my prediction anymore, as Roy Halladay has had a lackluster last few outings. What I would like to point out, however, is that I also mentioned that if Zack Greinke were to “regain his form, his final numbers might end up too good to ignore.” Well, at this point, that’s looking like the case. Greinke’s numbers are now so good across the board it looks like he may be a lock, at this time, for the award. He leads in the AL in ERA, WHIP, and Shutouts, is second in Ks behind Justin Verlander, and third in Batting Average Against, behind Matt Garza and Felix Hernandez, respectively. There’s still a month of baseball left to be played, but he looks like the clear front runner in that race and should bring a little bit of pride to what’s left of the Kansas City Royals’ fan base. Now, on to the topic at hand – the National League Cy Young race. Once again, I’ve narrowed it to a group of five: Chris Carpenter, Tim Lincecum, Matt Cain, Adam Wainwright, and Dan Haren. We’re going to do this one by process of elimination. Haren is probably the longest shot at this point, given his team’s standing. He has the least impressive record of the bunch and the highest ERA. However, I put a lot of weight on WHIP when it comes to assessing a pitcher’s performance, and in that aspect he is the best, 0.95. Like I said, though, he’s a longshot, and would need to finish out strong to have a serious chance. That leaves us with four. 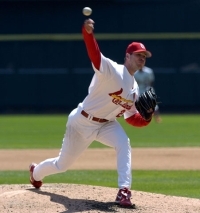 Adam Wainwright has the most wins of the bunch, racking up an impressive 17-7 record. But, he also has the highest WHIP and BAA, along with the next highest ERA behind Haren. His record is due in part to his team’s success. While he’s no doubt having a great year, his numbers just don’t stack up with this bunch. Matt Cain is also having an outstanding year for a contending club. Historically a hard luck pitcher, Cain boasts an impressive 13-4 record. His 2.51 ERA and 1.16 WHIP are more than respectable. Cain, though, is supposed to be a power pitcher, yet his strikeout numbers are low, and his K:BB ratio is easily the highest of the bunch. Next. And then there were two. Chris Carpenter (16-3) and Tim Lincecum (13-5) are the clear front runners for the award. I’ll be honest, I’m not sure I’m quite ready to choose between them. Carpenter has the better record, ERA, and WHIP, but Lincecum has substantial advantages when it comes to Innings Pitched, BAA, and has 34 more strikeouts than the next guy, Javier Vazquez, in the NL, and 104 more than Carpenter. Lincecum has thrown 34 more innings in 4 more starts than Carpenter. Granted, a pitcher shouldn’t necessarily be punished for missing starts due to injury, but you have to look at the numbers as a whole, and overall, I think Lincecum’s numbers are slightly more impressive. But, both guys have a few more starts to go, and that will be what separates the two. Carpenter will have an opportunity to set himself apart, and I think he’ll need it. Because, at this point, although unlikely, I’m predicting Tim Lincecum to be the first repeat Cy Young winner since 2002 when Randy Johnson won his fourth straight. The Chicago Cubs, mired in a 5 game losing streak, broke out in a big way tonight, taking advantage of the lowly Pittsburgh Pirates. They put up 14 runs in the first two innings, chasing newly acquired Charlie Morton after just one complete inning. Morton was torched for 7 hits, 10 earned runs, and 3 walks, before being relieved by Chris Bootcheck who surrendered 7 earned in 2.1 innings of work. Derrek Lee led the charge, going 3-3 with 7 RBI. Kosuke Fukudome added a 3 run home run, and Jake Fox, Ryan Theriot, Alfonso Soriano, Jeff Baker, and even Randy Wells drove in runs to lead the Cubs to a 17-2 victory. Just when people were doubting the Chitown Northsiders, the Cubbies broke out in a major way when they needed it most. The Cubs still trail the Cardinals, who have won 12 of their last 15 behind the hot hitting of Matt Holliday. If Chicago is going to have any chance at catching St. Louis, they’re going to have to ride this offensive surge to hit their way into the postseason. The Cubs will need big numbers from Derrek Lee to get into the postseason.